Joan Crawford was a movie star who defined the term "strong-willed." Starting in pictures when only 21, she was a star from the first, and continued to make films long after she might have called quits. A true great of the screen. Born into hardscrabble circumstances, Lucille's father left her mother shortly before her birth. Her stepfather, Henry J. Cassin, ran the Opera House in Lawton, Oklahoma. She loved watching the vaudeville acts from backstage, and as a result, wanted to go on the stage herself, focusing on dancing. In 1916, the family had moved to Kansas City, Missouri. Cassin left the family, and Lucille floundered in school. Her first boyfriend got her to do better in school, allowing her to enter college in 1922, but she dropped out. Lucille LeSueur bagan dancing in local touring troupes. Dancing in Detriot, she was spotted by Jacob J. Schubert, and before she knew it, she was dancing on Broadway in a show called Innocent Eyes. While in New York, she pestered M-G-M to give her a sceen test, which was sent to Hollywood. She was offered a contract, starting at $75 per week. She started January 1, 1925. 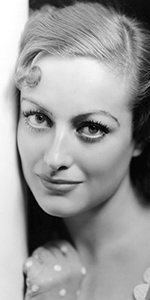 Pete Smith held a contest to find her a new name, and Joan Crawford was selected. It wasn't long before M-G-M gave her a meaty part in Sally, Irene and Mary (released in December, 1925). After that, she became the co-star to practically all of the M-G-M leading men, including Lon Chaney, with whom she made The Unknown (released in June, 1927). She credited Chaney with opening her eyes to the technique of acting. Figures. Her breakthrough film was the silent Our Dancing Daughters (released in September, 1928). She became the new flapper role model. Her next few films were great successes. She was cast in the the film Our Modern Maidens (released in September, 1929), and began dating her co-star, Douglas Fairbanks Jr.; they appeared together at the "Midnite Matinee" for The Broadway Melody on Saturday, March 30, 1929, where she was a "star guest" along with Anita Stewart, and George Sidney. Crawford and Fairbanks married later that year in June. Crawford worked hard to eliminate her Southwestern accent, making a sound film installment of the "Our" films, Our Blushing Brides (released in July, 1930. Crawford was one of the most popular of the M-G-M stars, contributing to the success of the all-star Grand Hotel (which had its world premiere at the Chinese in April, 1932), but when she was loaned out to star in Rain (which had its world premiere at the Chinese in September, 1932), it bombed. After divorcing Fairbanks, Crawford married actor Franchot Tone in 1935. Many of the Crawford films played the Chinese—a staggering parade of semi-interesting pictures. The public agreed, and Crawford's star began to wane. She enjoyed a huge boost by appearing in The Women (which had its world premiere at the Chinese in August, 1939). She married actor Phillip Terry in 1942. Crawford was dropped from the M-G-M roster in 1943, and was signed by Warner Bros. to a three-picture deal, culminating in her signature role as Mildred Pierce (released in October, 1945), which became a huge hit, and for which she would win the Oscar for Best Actress — something she wanted very much. More sort of so-so films followed in the wake of Mildred Pierce: Humoresque (released in December, 1946), Possessed (released in July, 1947), Daisy Kenyon (released in December, 1947) The Damned Don't Cry! (released in May, 1950), This Woman is Dangerous (released in February, 1952) and Sudden Fear (released in August, 1952). All of these "women's pictures" confirmed Crawford's status as role model to women everwhere: tough it out, girl! She married Pepsi-Cola chairman Alfred Steele in 1955. When Steele died in 1959, Crawford was given the brush, but she complained to Louella Parsons, and the result was that she was given a seat on the PepsiCo board of directors. The widescreen era wasn't so hot for Crawford, as she accepted a smaller role in The Best of Everything(which played the Chinese in October, 1959), and had a fine old time working on the bizarre antics of What Ever Happened to Baby Jane? (released in October, 1962). That same year, she published her autobiography, A Portrait of Joan. This was followed by the film Berserk (released in January, 1967), did a bunch of TV guest-starring roles, and uhh , oh yes — Trog (released in October, 1970). She published her oddly self-help book My Way of Life in 1971. She made her last appearance in public in 1974. She died of a heart attack in New York City in 1977, age 74. Grauman's Chinese Theatre, Hollywood, California. 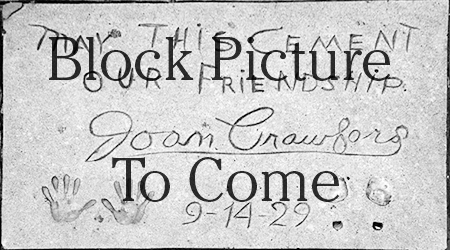 Joan Crawford Forecourt ceremony, Saturday, September 14, 1929. 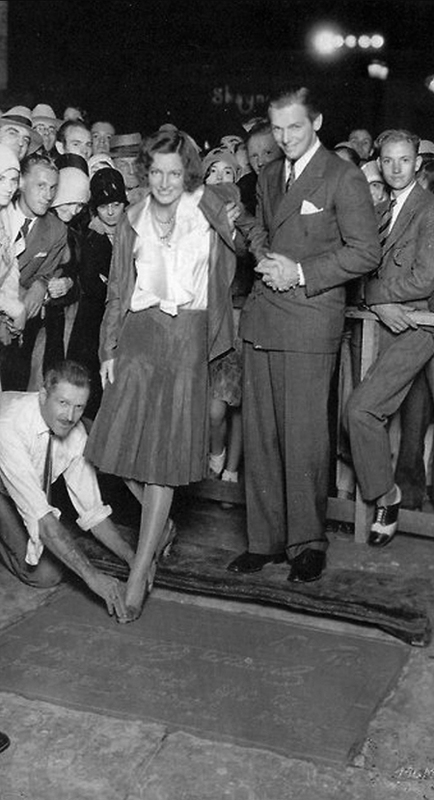 Crawford is assisted here by cement artist Jean Klossner (kneeling) and Douglas Fairbanks, Jr.